Here I go again with the vintage photography of New York - again, from my collection from the Met. I can't help it - I love seeing very old images of the city. The black and white romanticizes a lot of it and I know things weren't all that terrific back then. But when it's one-dimensional black and white, you can interpret the image however you like. 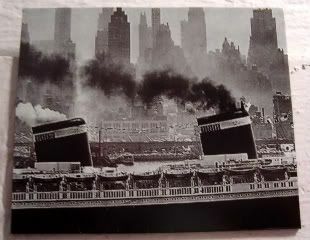 Andreas Feininger made this 1946 image of the Queen Mary cruising past 42nd Street. I have to tell ya'll, I would never go on a cruise these days to save my life. But back in the day? On a Trans-Atlantic ocean liner bound for England? Hells yes, I'd be there. With my supercute daysuits and matching overcoats (one for every outfit, natch), long evening gowns and matching stoles (one for every outfit, natch), uppercrust (probably English or Swedish or German) accent, and my feathered evening hats and long cigarette holder, and Glenn Miller or Count Basie playing in the background. Of course, I'd need to have Cary Grant or Gregory Peck or heck, even William Powell by my side. And I'd have to have some sort of coded note or priceless artifact in either my hatboxes or my steamer trunks, because of course, I'd totally be an Allied spy.